There are many books that discuss the notorious ‘Terrible-Two’ phases which young children may go through, however, not many target children in a specific age-group, much less examine the on-goings in consecutive 3-month periods of growth. In Fathering Your Toddler – A Dad’s Guide to the Second and Third Years, American author Armin A. Brott not only tackles issues peculiar to Toddlerhood, but meaningfully weaves in perspectives of Dads, issues relating to Mums, considers aspects of husband-wife relationship, and links them up holistically with the interests of the family unit as a whole. Brott, a former U.S. Marine, is a published author of several best-sellers on fatherhood, such as The New Father and The Expectant Father series of books. He hosts a weekly radio talk show ‘Positive Parenting’ in San Francisco Bay, blogs actively at www.mrdad.com, and writes a column ‘Ask Mr. Dad’ sharing parenting insights. The US-renowned parenting expert devotes 1 chapter each to 3-month growth periods of Toddlerhood, starting from the 12-month-old, to the 36-month-old youngster. This rather unique presentation structure allows time-hungry, hassled Dads to zoom in on specific ‘month-zone’ to learn more about their kids, themselves and how best to negotiate and progress from one growth zone to another. Materials are organised across 8 parts, with chapter titles such as ‘12-15 months: Getting Off on the Right (or Left) Foot’; ‘15-18 months: Keeping Communication Open’; ‘24-27 months: Off to School’; ‘30-33 months: Hey, Who’s in Charge Here?’; ‘33-36 months: Learning to Let Go’. Various aspects of family matters as a whole, including strategies for strengthening various relationships (eg. spousal/step-parenthood), even touching on issues such as schooling, family and financial planning! The inclusion of these distinct sections sends a strong message: Much as the book is about Fathers and Toddlers, Kids and Dads are essentially constituent, integral units of the larger family unit. Other members of the family (mums/wives) play no less important a role in the context of a healthy, balanced family life. Another commendable feature worth highlighting is its inclusiveness. Brott openly embraces issues encountered by families with children with special needs; families with parents grieving over their child’s death; blended (pre-fabricated) families formed as a result of divorces, remarriages; adoptive, single parents; old, young Dads; even Dads working in the military or long-absent from home due to job postings. In ‘21-24 months: What Are Daddies Made Of?’ Brott lists out 3 common but distinct parenting styles: Authoritarian; Permissive; Authoritative. Make requests, incentivise, negotiate and establish consequences. On one extreme end of the spectrum are the “Authoritarian” parents (the boss) who value obedience as a virtue,favour punishment whenever there is a gap between the parents’ desires and children’s behaviour; they also tend to yell, command, blame, bribe or threaten. “Permissive” parents (the servant/bystander), on the other hand, are often overly “tolerant and accepting of the child’s impulses”, and prone to pleading with her, giving up and doing nothing about her non-compliance with rules. Brott believes Dads need to take into consideration their toddlers’ temperament in order to discipline them effectively. In ‘18-21 months: Still Wild (or Mild) after All These Months’, he sets out ‘The Ten Temperament Traits of Toddlers’ to help Dads better understand the approachability, adaptability, distractibility, character-intensity, persistence/activity/sensory levels, and emotional sensitivity/moods of toddlers. This also helps Dads tackle tantrums that toddlers may throw at home or in public places! In another chart, he further analyses the impact of various parenting traits on the child’s behaviour, the nature of the parent-child relationship, their effect on the balance of power between Toddler and Dad and overall quality of the mood in family life. Dads: Relax & Enjoy the Process! Several humorous, clean-line cartoon illustrations intersperse the pages, making a light-hearted read of the problems, stress and frustration that often mark the growing, nurturing and fathering pains. 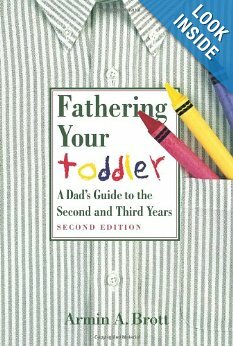 To top it off, the author generously offers an 8-page list of useful resources that may well offer answers to questions that continue to boggle the minds of Dads of 2 or 3-year olds! With this guidebook, Dads can relax, learn and enjoy both their Toddlers and the experience of fathering them!